Martin O’Neill recalls playing against the Republic of Ireland in two qualifiers for the 1980 European Championships. 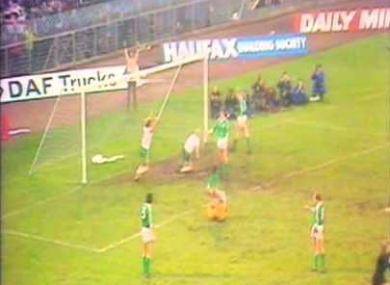 O'Neill was part of the Northern Ireland side that beat the Republic in a European Championships qualifier in 1979. REPUBLIC OF IRELAND boss Martin O’Neill says “there’ll be the occasional pang” as his team prepare to line out to face their Northern counterparts — the team the manager represented 64 times as a player between 1971 and 1984. When the Derry native was asked what the game meant to him, he responded: “Quite a lot, really. I naturally had a great time with the North. We had a very, very fine side way back, particularly in 1982, and the night in Valencia will be forever remembered. O’Neill also admitted that he would feel somewhat conflicted lining out against his former side on Thursday. The 66-year-old coach knows what it is like on the opposite end of the spectrum. As a player, he represented the North against Republic during two qualifiers for the 1980 European Championships. O’Neill and co drew 0-0 with the Republic in Dublin, before securing a 1-0 victory against a John Giles-managed side up in Belfast, with Gerry Armstrong’s header the difference between the teams. Neither outfit would ultimately qualify for the competition, with England going through, and the North and Republic second and third in the group respectively. “We played the Republic of Ireland, the North, a way back. I think it would be perhaps 1979 and because it was pretty new at that time, I think feelings were running pretty high then. Now I think things have settled down a great deal. “It was a game, as far as I can remember, that we were looking forward to. We played here in Dublin first of all and certainly there was a massive build-up to it because it was the first time the [the North and the Republic] had played against each other, certainly for a long, long time. In 1973, O’Neill was also part of the Shamrock Rovers XI — comprising of players from the north and south of Ireland — that lost 4-3 to Brazil in a one-off game at Lansdowne Road. The Republic boss says he does not expect a united Ireland team to come to fruition in the near future, however. Email “'Feelings were running pretty high... It was the first time the North and Republic had played each other'”. Feedback on “'Feelings were running pretty high... It was the first time the North and Republic had played each other'”.